There are many schools of thought when it comes to answering the 2 most important questions when trading and investing. Where will price turn and where will it go? What makes Online Trading Academy different is that we don’t subscribe to anything related to conventional fundamental or technical analysis. We don’t do this just to be different, we ignore conventional technical analysis theory simply because it’s very flawed at its core, which is why you don’t see people making a low risk living with it year after year. For today’s piece, let’s focus on the basics and look at a trade from a recent and very volatile session where market timing needed to be very precise in order to produce that day’s trading income. 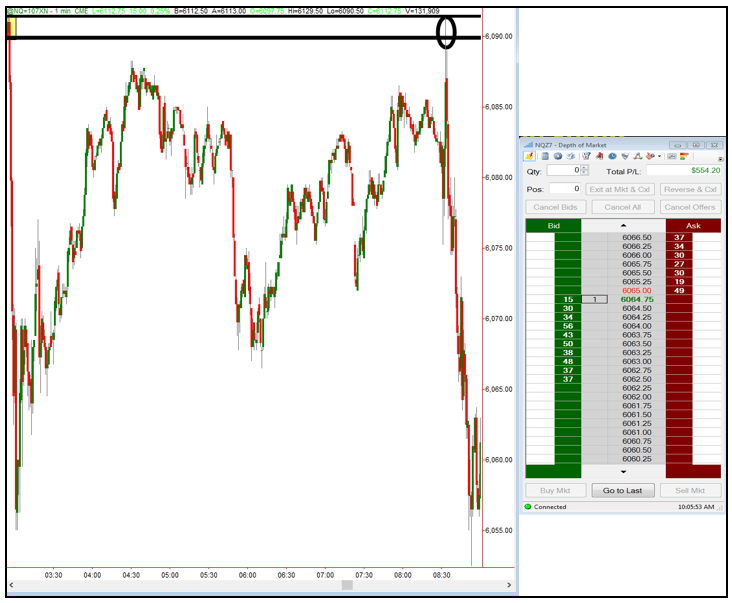 Notice the pattern, the little base of trading in the upper left corner and the huge drop in price from that base. This is the picture of supply that helps you be a willing seller high up on the supply and demand curve. With any picture of supply, you need to make sure it is very “fresh” meaning there are still significant unfilled sell orders in that area (price level). The entry, once the picture above is produced, is to short a rally back up to that supply level. The “drop” from the level tells us supply exceeds demand in that area. We sell short at the proximal line with a protective buy stop just above the distal line, and that’s the sell setup. This is the pattern right out of our Core Strategy course that we see live every day in the markets. Once price rallied back up to that level, the shorting opportunity is at hand if you wish to take the trade like I did. These are typical of our early morning income trades. This is not about taking many trades in an income trading session, it’s about taking the high probability ones that meet our criteria. There is nothing fancy about this, no indicators or oscillators or conventional chart patterns, there are not many different strategies, there is simply one. Buy where banks and financial institutions are buying and sell where they are selling. Another way to say that is, buy where the smart money is buying and sell where the smart money is selling. These groups leave clear footprints if you know what you’re looking for. One last way to say this is… Buy where demand exceeds supply and sell where supply exceeds demand. Keep it simple and focus on this and only this for your short-term income trading and long-term wealth investing. The purpose of this article was to help you focus and to identify what the picture of that looks like on a chart. Hope that was helpful, have a great day.